Navegation to Marbel Chapel starting from Puerto Guadal, including a nice cross of lake General Carrera for all passengers lodging in TERRA LUNA who do not want more to drive. The Marbel Chapel from your room at a glance with our boat “Flipper” for 12 Pers. We offer daily departures from Terra Luna, at 9h, 12h and 17h (4 PAX minimum). Excursion duration is approximatively 2h30 round trip for a 50km lake crossing. PATAGONIA HELITOURS invites all Aysen visitors to acheive their more ambitious dreams. You will be able to connect your hotel directly from Balmaceda airport or visit Aysen marvels from the sky and reach in a few minutes its most remote and beautiful spots. From its operation base in TERRA LUNA Lodge in Pto Guadal, on the shore of lake General Carrera lake PATAGONIA HELITOURS offers several tours and transfers that will captive your sight or get you in minutes exactly where you always dreamt to be. All public. Navigation on lake General Carrera to Pto Guadal marbel caves and Carabinero Island Short walk following Maqui to the numerous waterfalls. Return by land or boat to Terra Luna DURATION 2-3 hours. 2-3 hours trekking. All public. Walk with local guide from Terra Luna to the numerous waterfalls of rio Maqui. Back to Terra Luna walking, in vehicule or by boat. DURATION 2-4 hours according to return mode. FULL DAY excursion to Chile Chico and Jeinimeni Nacional reserve. All public. DURATION 10 hours. FULL DAY trekking to search for Veranada´s fossiles. Includes : Transfer by car, tourleader, picnic.Wonderful views. DURATION 5-6 hours. Mountain bike excursion to the “hidden mine” or to lake La Manga. DURATION 3-4 hours. FULL DAY trekking to Leones lake and its impressive glaciers. Transfer by 4×4 car to Mapuche glacier. Beginning of the trekking 2h, to reach the lake. Navigation with a zodiac to the glacier front wall. Lunch facing the glaciar. Unforgettable experience. Back to Terra Luna. DURATION 10 hours. FULL DAY trekking to Meliquina lake. Transfer by car to Punta Baja. Demanding trekking. Back to Leones Valley . Tour leader and lunch included. Tour of lakes and glaciers. DURATION 10-12 hours. FULL DAY excursion to Pto Bertrand, Baker river water fall, Cochrane and Tamango reserve to see “huemules”. All public. DURATION 8-10 h.
Extraordinary Canopo with a loto f different games, All public. DURATION 2 hours. FULL DAY excursion to Pto Tranquilo, Exploradores Valley, Marble chapel etc… . Transfer by car, cross boat until the marble chapel (if posible), tour leader, lunch, etc… All public. DURATION 8-10 hours. 4 days expedition to Cerro Mocho (2400m). Rock, Ice & snow clima. Extraordinary view on the icefield. Mountaineerers with a minimum of experience. 4 days trekking into wild and unspoiled mountains . Day 2: Climb to La picada pass and trek down into the forgotten valley. Camp. (CB,L,D). Terra Luna has an audiovisual equiped room and organises slide shows and movies. 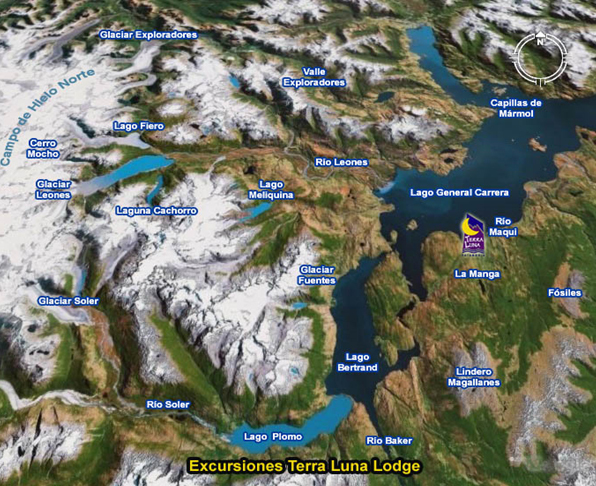 HOT TUB ”TERMA LUNA”:The best of Terra Luna, on the lake shore, to alternate cold and warm baths. SAUNA: Enjoy the first panoramic sauna facing one of the most beautiful view. Visit “La Boutique”, our minishop with souvenirs to do the best gifts to your friends or familily. PEDALO: Cycle boat for relaxing on the Lake. MINI CLIMBING WALL: To iniciate yourself during bad wearther days. EXTERIOR GAMES: Terra Luna has a game area for children and a “petanque” court for the adults. CANOPY: Terra Luna has a Canopy with anice view over the lake. FISHING: We can borrow you some Basic fishing equipments to try your chance on the shore of the lake. Fly to the most beautiful places, over the icefied, around San Valentin mount and to San Rafael lagoon. Patagonia OFF SEASON, appart from the best rates, offers the option to do nice excursions with snowshoes (provided by Terra Luna) a funny and healthy experience to live. Terra Luna has a jet boat tol et you feel the adrenalina.